I have been floating the idea of beginning a virtual UBI-sib to collect organized data, such as you are asking for, to be available to facilitate biochar oven development, particularly the JROs. Not the usual blog with the usual suspects pontificating on their usual topics. Answering questions for beginners and exchanging ideas, yes, but mostly a repository for particulars on designs and data on results of controlled tests and general operation. This is NOT something that Thayer should get stuck with maintaining – I’m guessing she has more than enough on her plate already. It would probably need to be moved to its own site with the UBI-sib just serving as a link through as soon possible. Or would the open source technology page be a good place to start it? Or could this biochar-production group develop such a function? Do you know of any bloggers who would like to manage such a site? A word about nomenclature. Hugh McLaughlin invited me to join him and Paul Anderson at their BEF camp where John Rogers was also in attendance. In the interests of solidarity we settled on the name JR Oven (in honer of John Rogers who did so much to get things started with his TLUD ovens shown in Ann Augustine’s vidio) which yields the convenient acronym ‘JRO’ (pronounced “’j’-ro”). 1. What is the best way to get primary air into the bottom of the drum and the best ways to control it? 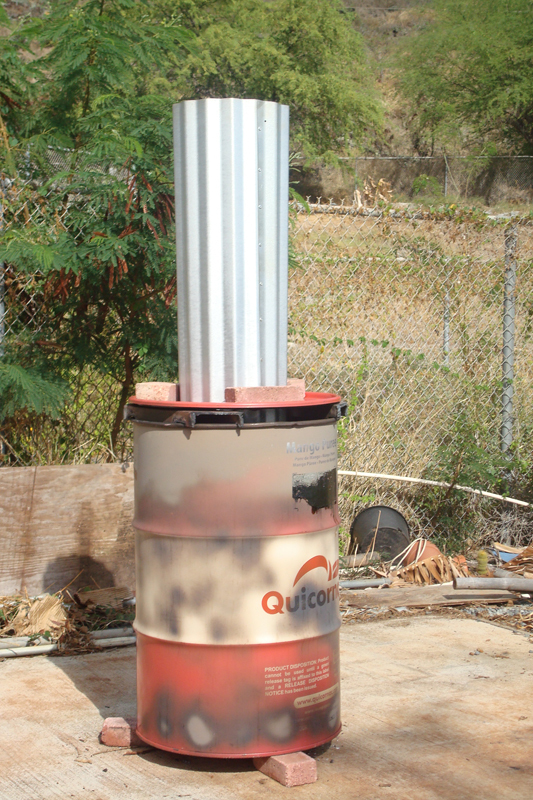 I’ve been working primarily with natural draft 200 l JROs for use off grid by 3rd world small holders. My aim was first to develop an experimental ‘frame’ with adjustable primary, secondary air and stack flow in order to determine the important parameters. To that end I began with a set pattern of uniform sized primary air holes in the bottom of the oven to distribute air and a chamber made of 1/3 of a barrel with a port and slip ring arrangement to regulate air flow into the chamber (see pictures on http://www.biochar-international.org/regional/mongolia July update). I’ve never run the ports at anything but full open and so have taken to not using the air chamber, simply setting the oven up on 3 bricks. 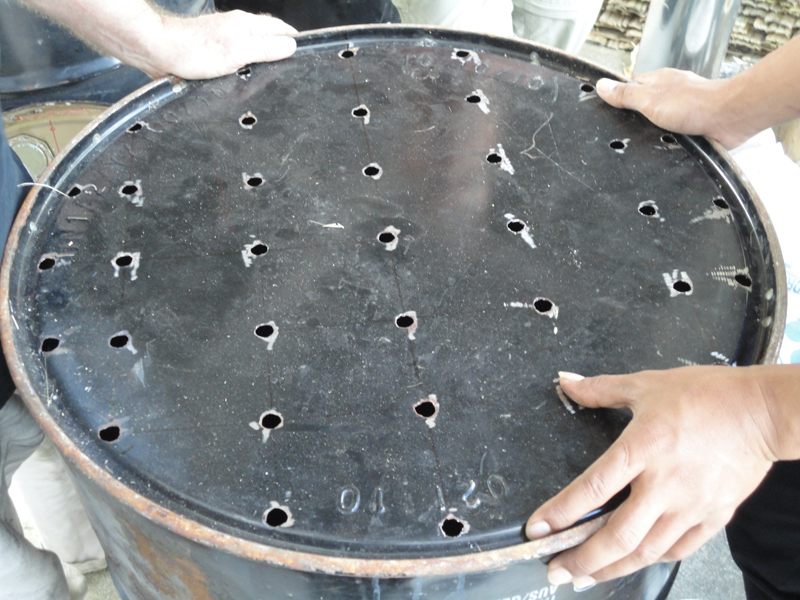 The circled square pattern of holes has been modified slightly and standardized with the corners of the square at the rim of the barrel. There are a number of geometric principles that can be used to determine the size of the square, the simplest seemingly is to rap a chord or flexible avon nisan kataloğu 2012 tape around the outer edge of the barrel and then use it to divide the circumference into 4 equal lengths which determine the location of the corners of the square. Next mark the edges of the square off into 4 equal segments and connect each point to its equivalent on the opposite side. Extend these lines until they intersect the rim or the barrel. You now have a 5 x 5 grid with 25 points where the lines of the square intersect and an additional 12 where the extended lines meet the rim. These are where the 37 primary air holes are drilled on the bottom of the oven. To date I’ve used ½ inch (13mm) holes, but am planning to run tests using sets of 3/8” (9.5mm) & ¼” (6mm) holes to see the effect as well as if multiple small holes (2, 3 or 4) can be substituted at each point for the bigger holes for those who don’t have large drills. Sorry, I have to catch a plane to the Korea symposium today so I need to break off for now to get ready. I’ll finish up with some more of the primary air options and the rest of your questions as soon as I get a chance. in the video by Ann Augustine. What is the best way to get primary air into the bottom of the drum and the best ways to control it? What are good ways to provide secondary air? 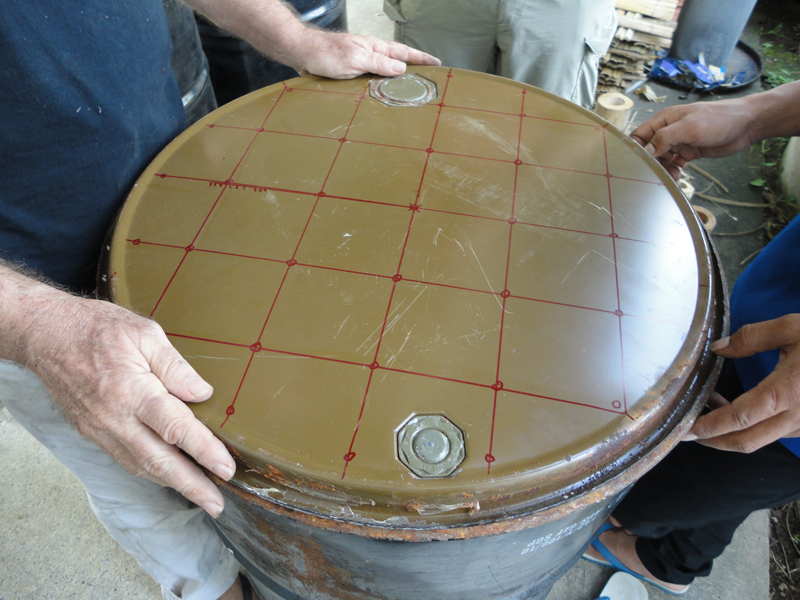 What is the optimum chimney diameter? What kind of insulation have people used, if any? How do these configurations change based on the feedstock used? What are the feedstock dimensions that work best? This is my biggest question. Will wood chips work or do they pack too tightly? If I add a fan to the primary air source does that make wood chip feasible? If I have chunks of wood, ie, chopped up sticks or cut up construction waste, what is the optimum size? IBI is a non-profit, member-supported organization and is counting on your generous donation to put the Earth Back in the Black!